Your All-in-one Acoustic Percussion Rig! Unlike the traditional kind of cajon you sit on, the Turbo Slap-Top Cajon sits in your lap, putting the playing surface comfortably in arm's reach. Four zones include a low tone in the middle, a high clean tone at the center edge, and a snare effect on either side of the walnut playing surface. The result is that you'll be able to pull a nearly inexhaustible range of sounds out of the Turbo Slap-Top Cajon, and thanks to the front-facing sound ports, even light finger rolls will project clearly in an acoustic performance. Can't take your kit to the gig? No problem. Grab a Meinl Turbo Slap-Top Cajon, and you're all set. 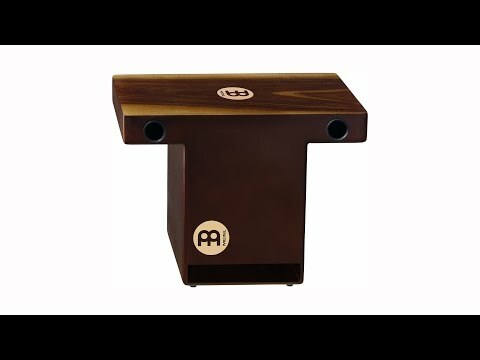 Take a full range of percussion sounds to your next acoustic gig with the Meinl Turbo Slap-Top Cajon!